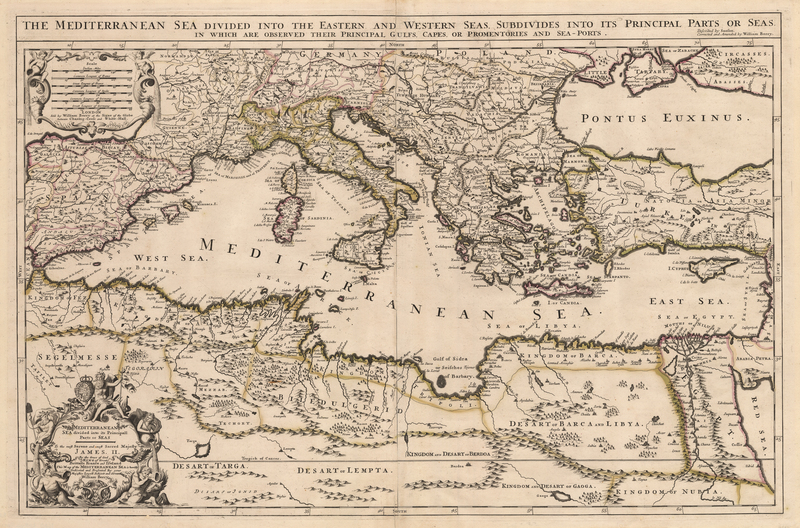 Mediterranean Sea divided into its Principall Parts of Seas - the Vintage Map Shop, Inc. This is a fine print reproduction of very scarce map of the Mediterranean Sea, its entire coastline, including much of the Ottoman Empire as it was in the late 17th century. William Berry was a bookseller, geographer and engraver who was active from about 1670 to 1703. He corrected and amended a set of maps by Nicolas Sanson which were frequently referred to as the ‘English Sanson Collection’. They were very rare and highly sought after. Due to the strong Dutch school of cartography in the 16th and 17th centuries, few English mapmakers reached a high level of distinction. Berry was an exception, producing maps that would compete with respect to accuracy and beauty with those of the great Dutch mapmakers.